Riteway Bus Going Green !!! Besides operating a charter bus service, Riteway also provides daily commuter express service from Washington County to Milwaukee County. The Washington County Commuter Express (WCCE) is the perfect alternative to driving a car to downtown Milwaukee for work. Come ride the WCCE bus and sit back, relax, and read the morning paper as you ride the bus to work. Visit www.ridewcce.com for more information. Each motorcoach has the potential of removing 55 autos from the highway. That’s millions of cars not driven annually, saving fuel, cutting emissions and reducing congestion. Motorcoaches produce carbon emissions of only 56 grams per passenger, compared to 371 grams for a passenger car. Diesel fuel is about 30% more efficient in combustion than gasoline, and today’s ultra low-sulfur diesel fuels are cleaner than ever. Motorcoaches use 946 BTUs per passenger mile, compared to 3,890 for planes and 2,134 for trains. Motorcoaches emit the least carbon dioxide (CO2) per passenger mile when compared to other vehicles. Carbon dioxide emissions are reduced by an average of 85% per passenger mile for every person who chooses motorcoach travel instead of driving alone. 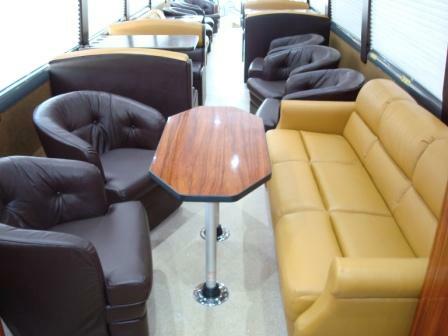 We have just added our second Luxury Executive Bus to our fleet: Exuctive II. Custom built to our specifications, these Luxury Executive Buses will offer you a unique luxury experience. We offer packages for either 1 day excursions all the way to long term 6 month lease options. “Our Luxury Executive buses can accomodate up to 26 passengers in ultimate comfort and luxury,” says Ron Bast, president of Riteway Bus Service, Inc. Please view our website for more information www.ritewaybus.com. Call our Executive Sedan & Limousine office at 1-866-273-8207 to inquire about our Luxury Exective Buses and to set up a personal showing. Small kitchen consisting of sink, ample counter space and cabinets. Riteway Bus Service has officially started our Tour Bus Service in Wisconsin. February 14th was our first planned bus tours and we had 4 buses go to Oneida Casino in Wisconsin. Riteway’s Tour Bus Service operates in Beaver Dam, Wisconsin and we have planned many exciting bus tours around the area. Riteway Tour & Travel Services the areas that surround Madison, Wisconsin to Milwauke, Wisconsin and north to Fond du Lac Wisconsin. Please visit our website www.ritewaybus.com to view all of our bus trips. 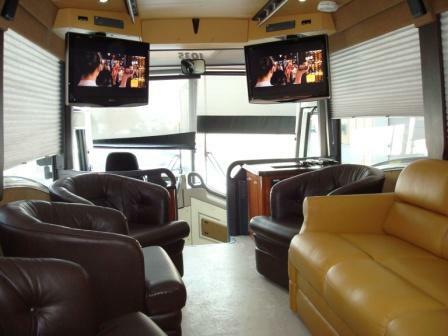 Riteway Bus Tours customizes bus tours to many exciting destinations around the country. We can help in all aspects of your trip including: arranging meals, recommending sightseeing attractions, finding great entertainment, coordinating airport transfers and arranging for guides and escorts. We will be glad to sit down with you and answer any questions you may have and help you plan your group tour. Call one of our tour planners to customize your next organization’s outing, senior group tour, church group trip or bank club destination. The Bus Industry Safety Council is an organization of safety professionals in the intercity bus and motorcoach industry in North America. The council is affiliated with the American Bus Association ABA, but membership in the council is not limited to ABA member companies and is open to all persons who are interested in and employed in positions promoting safety in the bus and motorcoach industry. The BISC meeting was held on Feb. 1st & Feb. 2nd 2008 in Virgina Beach. Riteway Bus Service, Inc. has been involved with BISC for a couple of years now and we are excited to be involved with helping shape safety in the bus & motorcoach industry. The big discussion this weekend was the minimum training Requirements for entry-level Commercial Motor Vehicle Operators, Proposed Rule. While all operators agree that driver training is crucial for bus & motorcoach operations, the proposed rule must be looked at again or it could have negative unintended consequences for our businesses.